Chroma Key Lab 2 by Pixnub is a batch processing system to create compositions. It uses either EZ Green Screen or pre-extracted images. 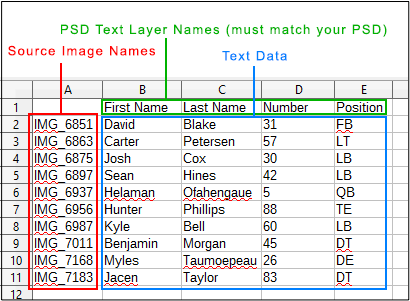 Chroma Key Lab uses the CSV data to customize the compositions on a per image basis. CSV functions include the following. CSV files are typically setup in a spreadsheet program such as Excel on Windows or Numbers on Mac. The spreadsheet must be saved in .csv file format. Don't worry if you don't have all of the data. You can always edit your CSV to add Subject info later, but you'll want to have at least First and Last name fields on your CSV to get your Snapizzi Project setup. Column 1: Must contain the source image names. The file extension is optional. It will work either way. Leave Cell A1 blank. Start with A2. Row 1: This is the header row. It contains the “commands” for Chroma Key lab to use (layer names, resize methods, etc.). These DO NOT need to be in any specific order. Also, only use the columns you need. For example, if you are not using different backgrounds for specific images then don’t and the background file column. Data Section: This is everything from below row 1 and right of column A. This contains the data the Chroma Key Lab will use. 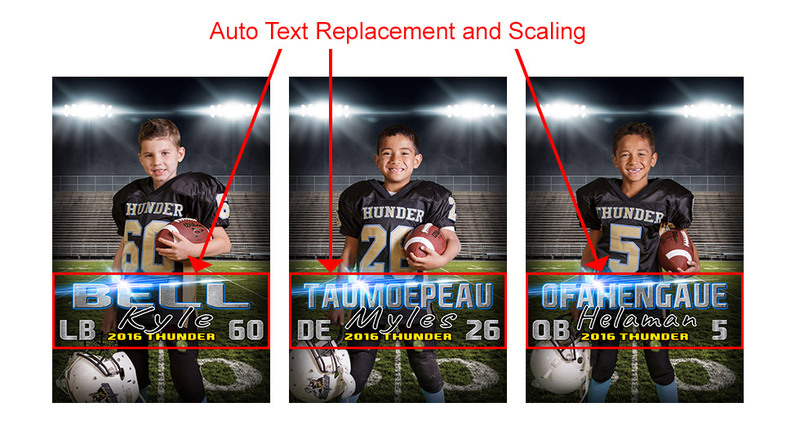 Add a header starting with resize- followed by the Layer Name that will be auto scaled. In the data section, add the scaling command. The commands are as follows. Once you have your CSV prepared. Upload it to your Snapizzi Data Project as you normally would and generate your Camera Cards for the Project. You're now ready to shoot. After your images are uploaded and processed, request a Bundle for your Project. Because it is designed for school service items, the manifest.csv will not have all of the columns that were on your original CSV, but all we need from this are the images and filenames to copy for the next step. Now request a Subject List which will contain ALL of your original data. Be sure to double-check that all rows of data match between the two files. Then copy & paste the filename column to your downloaded Subject List. Also, delete any columns not needed for Pixnub. That's it! You now have a CSV file properly formatted along with all needed images to deliver to Pixnub. Need a beautiful way to collect data? We love Typeform.